Soar away on a magic carpet ride of nonstop enchantment in the most spectacular animated adventure of all time! Embraced by critics and audiences of all ages, Disney's Aladdin became the #1 film of the year, winning 2 Academy Awards® for Best Song, "A Whole New World" (Alan Menken, Tim Rice) and Best Score (Alan Menken). Set in the mythical city of Agrabah, the story follows a street-smart peasant, Aladdin, and his mischievous pet monkey, Abu. Aladdin falls in love with the free-spirited Princess Jasmine - despite a law that says she can only wed a royal suitor! His luck changes with one rub of the lamp, releasing the shape-shifting, fun-loving, wish-giving Genie - who turns him into a Prince! But the evil sorcerer, Jafar, and his wisecracking parrot, Iago, also crave the lamp's power. If Aladdin is to defeat them and win Jasmine's heart, he must learn to be himself - and that's one wish the Genie can't grant! With a magical mix of delightful Disney characters, breathtaking Disney artistry, and playful humor, "You couldn't wish for a more wonderful film!" (Joel Siegel, ABC-TV) Now enjoy all the phenomenal fun of Aladdin ... anytime you wish! 1992’s Aladdin continued the brief-lived era of good feelings at Disney animation. After the doldrums of the prior decades, 1989’s The Little Mermaid marked the studio’s return to cultural relevance, and 1991’s Beauty and the Beast solidified that hold with newfound critical glory. Aladdin didn’t receive quite so many plaudits but it did well for itself in that department and also raked in the bucks at the box office. For the first time in decades, a Disney cartoon emerged as the year’s top-grossing flick; Aladdin’s $217 million put it well ahead of contenders like Batman Returns and Lethal Weapon 3. 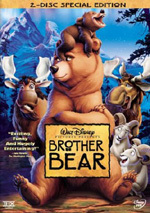 This would be the last time a traditionally animated flick would top the box office charts. 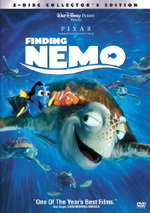 Since then, only 1995’s computer animated Toy Story had won a year’s box office competition, though 1994’s The Lion King and 2003’s Finding Nemo placed second for their years. In addition, 2004’s Shrek 2 stands an awfully good chance of earning this year’s crown. At the start of Aladdin, evil sorcerer Jafar (voiced by Jonathan Freeman) seeks the Cave of Wonders, the repository for a magical lamp. His stooge Gazeem attempts to fetch it, but only “the diamond in the rough” may enter, as they violently discover. From there we meet thieving street urchin Aladdin (Scott Weinger) and his loyal pet monkey Abu (Frank Welker). They live a hand-to-mouth existence but dream of fortune, a concept epitomized by the local Sultan (Douglas Seale). He lives with his teen daughter Princess Jasmine (Linda Larkin) who resists his attempts to find her a husband. The law dictates that Jasmine must marry by her next birthday, and it occurs in only three more days. She clings to the notion of romantic love, though, and pines for more freedom and independence. The Sultan frets but his advisor Jafar offers a solution if he can use the leader’s magical blue diamond ring. He hypnotizes the Sultan and attempts to enact his own evil plan. He uses the blue diamond to find out the “diamond in the rough”. This person turns out to be Aladdin, so he sends palace guards to capture the boy. In the meantime, Jasmine disguises herself to enter the community. She finds herself overmatched, though, and gets into inadvertent trouble. Aladdin rescues her and the pair immediately connects. They open up to each other before the palace guards find them. Even though Jasmine reveals her true identity and tries to get them to free Aladdin, they cling to Jafar’s orders and take the boy into the palace. When Jasmine orders Jafar to release the prisoner, the wizard claims that they already killed Aladdin as a thief. Of course, he lies, as Aladdin is stuck in jail. Abu frees him and an elderly prisoner - Jafar in disguise - regales them with tales of the Cave of Wonders, a place filled with treasure that he can use to win over Jasmine. The “old man” leads Aladdin to the Cave and sends him inside, where he goes to fetch the lamp. Though warned not to take anything else, Abu can’t resist and he snags a gem. This causes the Cave to collapse, but they escape on a friendly flying carpet. Jafar gets his lamp and tosses Aladdin back into the Cave, apparently to suffer his demise. However, he clings to life, and we see that Abu pilfered the lamp back from Jafar before he fell into the Cave. When they shine the object, they discover its secret: it contains a powerful Genie (Robin Williams). He gets them out of the Cave and then helps Aladdin with his first wish: to become a prince. From there, the crew struts into Agrabah to win over the Princess. This crimps Jafar’s style, as he planned to marry Jasmine himself and take over as Sultan. The rest of the movie follows Aladdin’s attempts to win over Jasmine as well as Jafar’s plots and their ramifications. One of Aladdin’s strengths may ultimately turn into a weakness. Much of the film’s success stemmed from its manic turn by Robin Williams. He single-handedly made it cool for big stars to do cartoon voiceovers and brought unprecedented attention to an actor in such a role. He infused the movie with relentless energy that often made it a comic wonder to behold. Williams also left the movie with a stronger time stamp than usual. Virtually all films represent the eras in which they were made. Compare Saving Private Ryan to The Longest Day. Both cover similar subject matter but certainly don’t resemble each other in many ways, and it becomes clear that the attitudes of their respective chronological circumstances mark them. This becomes especially true for Aladdin due to its style of humor. How many of its jokes will make sense 50 years from now? Probably not a lot. While it doesn’t feature extreme amounts of topical comedy, it roots many of the gags in social references that may not translate well. I think that the film’s strengths ultimately override any of these concerns, however. Watching Aladdin for the first time in a few years, I was struck by just how much Williams owns this film. The Genie doesn’t appear until half an hour into the flick; we briefly hear from Williams in his short role as the merchant, but after that he disappears until a third of the film has finished. When Williams reappears, he quickly grabs hold of the movie and makes it his own. In Disney flicks, supporting characters often overshadow the main roles, and the Genie presents an extreme example of that. Though the filmmakers don’t go out of their way to put the Genie at the center of the action, Williams’ manic personality ensures that this happens. Don’t interpret that as a criticism of Williams and an indication that I see him as some sort of movie-hogging prima donna. Admittedly, I’m not a huge fan of the man’s work, mostly due to his modern tendency to select mawkish films in which he plays insufferably smug and condescending characters like Patch Adams. Nonetheless, he dazzles in Aladdin, as he makes the Genie a force of nature who carries the movie to the promised land all on his own. Well, maybe not all on his own, though without Williams, this movie could have been much less satisfying. As for the rest of it, I can’t summon many reasons to complain, even though Aladdin and Jasmine don’t create a lot of sparks and the movie conveys an awfully generic “be yourself” message. On the other hand, once we get past the Genie, I also find it difficult to conjure lots of compliments. The cartoony style of the flick made it unusual among Disney’s then-recent history, and its manic tone allows it to stand out from the crowd. Granted, much of that comes from Williams, but the filmmakers keep up with him and use the energy for the benefit of the story; the hyperkinetic attitude melds well with the story and humor. The movie builds well; even though its first third drags, the climax becomes fun and clever. Aladdin also includes one of the most effective bits of animation I can recall in recent Disney history: the Magic Carpet. Supervising animator Randy Cartwright brings a remarkable level of personality and individuality to a rug. The character boasts no face or limbs to express emotions, but darned if he/she/it doesn’t turn into one of the movie’s most likeable and endearing participants. Overall, Aladdin remains a pretty enjoyable and lively flick. I admit it doesn’t wow me like it did a decade ago, and some parts of it have started to age less than gracefully. Nonetheless, a knockout performance from Robin Williams carries much of the weight, and the rest of the film does enough well to make it amusing and entertaining. 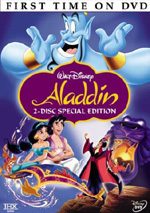 Aladdin appears in an aspect ratio of approximately 1.66:1 on this single-sided, double-layered DVD; the image has been enhanced for 16X9 televisions. Aladdin didn’t quite match up with Disney’s absolute best transfers, but it fared strongly overall. Sharpness seemed solid most of the time. At most times, the movie remained crisp and well defined. Some shots looked a little soft, though, especially in wider angles. Jagged edges and moiré effects appeared absent, but I noticed mild to moderate signs of edge enhancement. These created most of the distractions, as they occasionally gave the movie its minor lack of definition. In regard to print flaws, I noticed none, as the movie looked clean and fresh from start to finish. The setting of Aladdin meant that it boasted a wonderfully vivid and varied palette, and the DVD presented those hues well. The colors consistently looked terrific. The hues always came across as lively, and the movie handled lots of colored lighting with aplomb. Black levels mostly looked solid, though I thought nighttime skies seemed slightly inky. Low-light images were concisely displayed and tight, with no excessive opacity. Aladdin presented a consistently good transfer that fell below “A” level due to the issues created by edge enhancement. Aladdin also provided a pretty strong Dolby Digital 5.1 soundtrack. 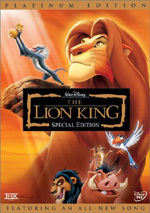 As occurred with The Lion King, we can watch the movie with either the “standard” Dolby 5.1 version or an all-new “enhanced home theater mix”. I opted for the latter and found it to present a generally strong piece. Aladdin featured a moderately active soundfield. All five channels presented a mix of different elements that made them work frequently throughout the movie. Effects played an active role in the proceedings and helped bring the action to life. Quieter sequences demonstrated a nice feeling of atmosphere, while louder ones kicked the track into higher gear. Elements zipped around the spectrum convincingly. Where the track lost some points connected to the music, especially the songs. The elements of the tunes tended to be too heavily isolated within their respective channels and they failed to mesh together well. The quality of the music also lacked great pep. The songs and score often came across as a little anemic, as they didn’t present the vivacity I expected. They never were bad, but I expected music with stronger punch. Otherwise, audio quality seemed positive. Speech came across as natural and crisp. Music varied somewhat but usually was solid. Effects always sounded accurate and dynamic. Those elements presented good bass response and seemed tight and well defined with no signs of distortion. All of this resulted in a soundtrack that merited a “B+”. Aladdin comes as a two-disc “Platinum Edition” release with plenty of supplements. On DVD One, we find two separate audio commentaries. The first presents remarks from producers/directors John Musker and Ron Clements and co-producer Amy Pell, all of whom sit together for a running, screen-specific chat. They get into a nice mix of topics. We learn about the visual design of the movie and how this represents themes, influences, the characters, their development and casting, the music and the songs, cut sequences and various changes made along the way. They toss in fun stories about working with Robin Williams and also make sure we know what animators did what on the film. The commentary moves at a good pace and provides a winning exploration of the flick. For the second commentary, we discover remarks from supervising animators Andreas Deja, Will Finn, Eric Goldberg and Glen Keane. All four sit together for their running, screen-specific discussion. They cover a mix of subjects related to animation and the general production of the film. They point out who did what for the art and also talk about influences, inspirations, and character design and development. They also relate notes about changes and cuts. An awful lot of this information already appears in the first commentary, so don’t look here for great insight. That comes as a disappointment. This track includes four men with a ton of animation experience, and I hoped to hear a lot about their styles, methods and whatnot. Instead I got a pretty general chat with only occasional examples of revealing information. They devote much of the track to praise and tell us how much they like different parts. While the occasional nugget of value appears, this commentary mainly comes across as redundant after the prior one. Aladdin also presents a text commentary called Pop Up Fun Facts. This presents information on many topics. We get notes about historical inspirations and explanations of the movie’s references, the visual design and themes, casting and characters, the music and unused songs, trivia and hidden gags. A fair amount of the information repeats from the commentaries, so don’t expect an abundance of new material. In addition, the track goes “quiet” a little more than I’d like; it drops out for slightly extended periods at times. Despite those issues, it gives us a concise synopsis of various elements, with a particular emphasis on variations and changes, so it gives us a good look at the movie. For actual examples of unused material, we head to Deleted Songs. This includes four numbers: “Proud of Your Boy” (three minutes, 59 seconds), “You Can Count On Me” (2:24), “Humiliate the Boy” (3:56) and “Why Me” (3:44). We see these via story reels, with basic renditions of the tunes. Each clip starts with an introduction; in these we hear from Clements, Musker, story supervisor Ed Gombert, and composer Alan Menken. They discuss the songs and we get information about their removal; some of this already appears elsewhere, but the participants explain the pieces well. It’s very cool to listen to these dropped sequences. We get more removed material with two Deleted Scenes. This area features “Aladdin and Jasmine’s First Meeting” (two minutes, 53 seconds) and “Aladdin in the Lap of Luxury” (2:54). Story reels represent both, as no kind of animation appears. The former demonstrates a pretty silly alternate take on the characters’ initial encounter. The latter shows some elements of the removed subplot that involved Aladdin’s mother and also comes from a version in which our hero had unlimited wishes; it corresponds loosely to the sequence in which Aladdin reneges on his promise to free the Genie. Neither stands out as great, but I nonetheless appreciate the opportunity to see them. Introductions precede the clips; we hear from Musker and Clements. They again give us relevant discussion of the cuts. Within “Music & More”, two subdomains appear. The first provides Music Videos for two songs. Actually, it’s not that simple, as additional elements come with these. For “Proud of Your Boy”, simpy American Idol runner-up Clay Aiken croons a predictably insipid take on the tune in this dull lip-synch video. The same “original story reel” for the song repeats from the “Deleted Songs” area, and we also find a three-minute, 22-second “Behind the Scenes of the Music Video”. It shows shots from the shoot along with comments from Menken, Aiken, Musker, Clements, and Walt Disney Music president Chris Montan. They provide some basic notes on the tune, choosing Aiken for it, the song’s relevance to the singer, and recording it. Not much more than fluffy talk shows up here. For “A Whole New World”, we discover two separate music videos. In addition to the original from Regina Belle and Peabo Bryson, current flavors of the month Jessica Simpson and Nick Lachey do a new version. Both renditions are soppy, over-produced messes; I like the movie’s take the best. As for the videos, both stick with the simple lip-synch/movie clip format typical of the genre. At least the Belle/Bryson edition gets a little creative and has them emote in a desert setting; Simpson and Lachey don’t even pretend to leave the recording studio. We see more of them in another “Behind the Scenes” segment. Clearly intended to tout the DVD on TV, the three-minute and 48-second piece includes remarks from Simpson and Lachey. They chat about how excited they are, how much they love the track and movie, and how much they have to offer to it. The program’s so puffy that it makes the “Proud” featurette look fantastically deep by comparison. At least Simpson looks particularly cute here. “Music & More” also provides Disney’s Song Selection. This basically acts as an alternate form of chapter menu. It lets you jump to any of the film’s five song performances, and it also allows you to show on-screen lyrics. As DVD One starts, we encounter a mix of ads. We find trailers for Pooh’s Heffalump Movie, Bambi, The Aladdin Trilogy and the Make A Wish Foundation. These also appear in the disc’s Sneak Peeks domain along with promos for Mulan, Mary Poppins, Mulan II, JET IX and the Disneyland Resort. DVD One features the THX Optimizer. Also found on many other DVDs, this purports to help you set up your system for the best reproduction of both picture and sound, ala stand-alone programs such as Video Essentials. I’ve never tried the Optimizer since I’m happy with my settings, but if you don’t own something such as Essentials, the Optimizer may help you improve picture and audio quality. With that we move over to DVD Two and its myriad of features. These split into two areas. “Games & Activities” includes four elements. Aladdin’s Magic Carpet Ride touts itself as a “Disney virtual DVD ride”. Somewhat similar to the “Virtual Safari” on the Lion King DVD, this sends Aladdin around various settings to try to save Jasmine. Bizarrely, it plops Timon into the action as well! One difference comes up here: occasionally you need to find “clues” to help you on your way. This part of the game seems surprisingly unforgiving; it allows you one shot, often without much on which to base your choice, and that’s it. Not that it seems to matter in the end, as I solved it without many clues and without much idea what I’d done. The whole thing’s pretty tedious and not much fun. It concludes without any special reward. Two options come with Inside the Genie’s Lamp: a “guided tour” and a “self-guided tour”. I tried the former, which lasted six minutes and 10 seconds. It takes a Lifestyles of the Rich and Famous approach for another cute but insubstantial piece. Next we get the 3 Wishes Game. Subtitled “Your Fortune Revealed”, this requires you to select a button that will release a coin to head toward a mechanical representation of Jafar’s head. If you get it in his mouth, he commands you to make a wish. Press a button and he tells you “your wish is granted”. And that’s it! As far as I can tell, nothing else happens here, so it comes as a waste of time despite some new voiceover performances for Jafar and Iago. “Games & Activities” ends with The Genie’s World Tour. In the three-minute and 10-second piece, we hear Jafar and Iago comment on postcards they get from the Genie. We also see animated shots of these cards. It’s cute and that’s about it. From here we go to ‘Backstage Disney” and its components. It begins with a documentary called A Diamond in the Rough: The Making of Aladdin. As a short intro from film critic Leonard Maltin explains, this piece can be viewed in three different ways. “Your Wish Is Our Command” presents a basic 42-minute and 31-second show that lets you branch off to “additional bonus segments” from time to time. “Play All” combines the main program with the extra bits into a single one-hour, 49-minute and 52-second monster documentary. Finally, an index lets you pick and choose from all the various elements. In the interest of simplicity and completeness, I went “Play All” and watched the whole thing all in one neat package. It takes an unusual format in that it combines a broad mix of elements. The show starts with the Maltin-hosted “An Evening With the Creators of Aladdin”, a presentation with Musker, Clements and Pell. They chat about the flick’s origins and development. Although they already touched on the topics in the commentary, some new information manages to emerge here. The “Evening…” presentation winds up as the anchor to “Rough”. The program interrupts it with a mix of other elements, but we always come back to it. Subsequent parts of “Evening” include remarks from Menken, Deja, Goldberg, Finn, supervising animator Randy Cartwright, production designer Richard Vander Wende, supervising CGI animator Steve Goldberg, and actors Scott Weinger and Gilbert Gottfried. Subjects discussed go over the songwriters’ role in the flick’s development and some specifics of the tunes, casting the animators and their approaches to their characters, other animation issues, signing the actors and their takes on the roles. Some “backstage” segments show Gottfried as he chats informally with the various participants. What else shows up in “Rough”? UCLA associate professor Dr. Ali Behdad conveys the history of the Arabian Nights tales and differences between the original story and the movie. Goldberg, Pell, Musker, Clements, Gombert, co-writers Terry Rossio and Ted Elliott, and Cartwright reflect on “Black Friday”, the day in early 1991 after studio executive Jeffrey Katzenberg slammed the work in progress, and its impact on the production. Keane, Musker, Clements and actor Scott Weinger then chat about the design for Aladdin and methods used to reflect his character. After a segment that shows the various stages of animation for one scene, Keane discusses crude methods artists use to check the fluidity of their work. A segment about the recording of “A Whole New World” follows with comments from Menken, Keane and singer Lea Salonga, and we then see rough animation for “Prince Ali”. Next Steve Goldberg, Cartwright and computer animator Tina Price discuss the approach to the Magic Carpet that almost made him CG. Eric Goldberg and caricaturist Ed Wexler go over the influence of Al Hirschfeld and that artist’s life. Henn and his sister Beth talk about his work on Jasmine, the challenges she presented after two prior leading ladies and inspirations. Deja gets into the look of Jafar and early concepts before cleanup supervisor Vera Lanpher-Pacheco, Eric Goldberg and art director Bill Perkins discuss her department’s work on the movie and the use of thick and thin lines. Actor Jonathan Freeman goes to a specialty store to attempt to overcome his longtime fear of birds in a quirky feature. If I had to find a drawback about “Diamond in the Rough”, it would stem from the disjointed nature of the piece. Actually, it meshes together better than I thought it might, but it remains a loosely-connected collection of different materials, so it doesn’t flow like a standard documentary might. Nonetheless, “Rough” works quite well due to the sheer amount of information and the quality of the notes. Inevitably, some of these repeat previously-provided tidbits, but we find a lot of new elements on display, and the surfeit of archival materials adds measurably to the package. The footage from the recording studio works particularly well and makes one wish they’d provided an alternate audio track packed solely with Robin Williams’ improvisations. Despite a lack of fluidity, “Rough” includes a very good history of the project that complements the other aspects of the DVD well. It’s a terrific piece. Continuing through “Backstage Disney”, we get a featurette entitled Alan Menken: Musical Renaissance Man. This 19-minute and 58-second program provides notes from Menken, parents Norman and Judy, wife Janis, Musker, Clements, Disney Music president Chris Montan, actor Paige O’Hara, lyricist Tim Rice and producer Don Hahn. We get a look at his life and the growth of his career from his early days through his partnership with Howard Ashman through his time at Disney. The piece offers a smattering of nice notes, particularly in regard to Menken’s early years, but it comes across as pretty fluffy and superficial overall. There’s a lot of praise on display here and not a ton of hard information. Inside “The Art of Aladdin”, two elements appear. An eight-minute and 46-second Art Review shows a variety of drawings and paintings along with commentary from Musker and Clements. We watch concept art connected to Aladdin as the directors let us know how the material influenced the film’s development. It’s a tight and efficient examination of the subject. When we go to the Still Frames Gallery, four subdomains materialize. These offer looks at “Visual Development” (38 images), “Story Development” (18), “Backgrounds and Color Keys” (15), and “Character Development” (173 spread across 16 subjects). These don’t present the most exhaustive package of stills for a Disney animated flick, but they offer a good cross-section and provide a nice examination of the various forms of development. For the final area, we get “Publicity”. This presents trailers for Aladdin as well as direct-to-video sequels Aladdin and the King of Thieves and The Return of Jafar. Lastly, the Publicity Gallery divides into three smaller areas. We get stills for “Theatrical Posters” (three), “Unused Concepts” (10), and “Theme Parks” (22). I especially like the last two, as they give us fun glimpses of alternate ads and various attractions, respectively. A sensation when it first appeared in 1992, some parts of Aladdin now seem a little creaky. Nonetheless, a stellar performance from Robin Williams helps overcome most of its problems and means that the movie continues to provide a lot of entertainment. Both picture and sound mostly work well, though they demonstrate a few minor issues. Few qualms greeted the DVD’s supplements, as the set packed in a slew of useful and informative pieces. Overall, I felt very pleased with the DVD of Aladdin, as it provided a strong depiction of a fun flick.